The single most important part of winning a Michigan driver’s license restoration appeal case is that you must be genuinely sober. I have written rather extensively about this, but apparently, not quite enough, because my office always gets calls from people who want their licenses back, but still drink, and think that’s okay. It’s not. In this article, I want to make clear that if you have lost your license for multiple DUI convictions , the Michigan Secretary of State won’t even consider giving it back until you prove that you no longer drink. This is a simple point that seems to be completely missed by loads of people, because all too many want to try and prove that they are “sober” by explaining that they no longer drink and drive, or that they have managed to cut down or limit their drinking. It doesn’t work that way…. Let’s clarify the legalities first. To win a Michigan license reinstatement appeal, you have to prove, by what the Michigan Secretary of State’s Driver Assessment and Appeal Division (DAAD) rules establish as “clear and convincing evidence,” that your alcohol problem is “under control,” meaning that you can fix a sobriety date since you haven’t had a drink, and that your alcohol problem is “likely to remain under control,” which essentially means that you must prove that you are likely to never drink again. Ever. From the state’s point of view, if your license has been yanked because of drinking and driving issues, your relationship to alcohol is seen as dangerous, problematic and risky; too risky, in fact, to let you drive as long as alcohol has any place in your life. Accordingly, the Secretary of State’s DAAD is NOT interested in taking the risk that someone who has lost his or her license as a habitual alcohol offender has, against all the odds, managed to somehow (and miraculously) become a normal social drinker. Instead, the DAAD requires, as a condition of giving a license back, that you prove you have quit drinking and established an alcohol-free, sober lifestyle. This is an all-or-nothing proposition. Either you drink, or you don’t. In the world of winning license appeals, this translates either you will, or you won’t. And from my side of the desk, I only take cases for people who have really stopped drinking. In exchange for that, I provide a guarantee that I will win your case. This means you’ll only pay me once, and you will get your license back. Still, no matter how many times I insist that I won’t, there are some callers who think that as long as they can just “play along” with the not drinking requirement, I will take their case. I won’t take a case for anyone who is still drinking, and the state won’t give any such person his or her license back, either. I could go into a lot of detail here, and, many places on my website and in lots of articles on this blog, I have done just that. Here, I want to make clear the very simple, but very important point that to be any kind of realistic candidate to win your license back, you really and truly must have quit drinking. “Quit” means just that. If you even think about trying to qualify that in some way, then you haven’t really “quit,” and you are exactly the kind of person the DAAD is trying to keep off the road. I know that may sound harsh, but do you really think that the state would, or even should, require any less? If we take this all the way, you can imagine the news story where there is a DUI fatality, and the reporter notes that the driver at fault had lost his license because of multiple drunk driving convictions, but then had it given back. Wouldn’t it sound crazy if the reporter said something like “according to records filed with the Michigan Secretary of State, the driver appeared to have brought his drinking under control, and testified that he only had the occasional beer once in a while”? Seriously, if you get into a sober mindset long enough, you can understand why most people would yell at the TV that the state should have never given this driver back his license at all if he was still screwing around with alcohol. Again, this is an all or nothing proposition: Either it makes perfect sense to you, or not. And if you are struggling with this, then whatever else, you’re simply not ready to win a license restoration case. Here’s the irony, though – absolutely every single person who now stands ready to win a license restoration case used to be someone who was not. Every former drinker used to be a drinker. The point I’m making is that I don’t want to alienate or anger someone who is not at this point in his or her life. If anything, I want to encourage such a person to get to the point where you honestly quit drinking. Within the last few months, I had a new client who told me he has been sober for about 2 years. When we got to that point in our first meeting (the first meeting lasts 3 hours) where I asked him what really made him decide to quit drinking, he kind of smiled and said, “You did.” To be honest, it was an awkward moment for me. With more than a trace of hesitation, I asked him to explain. He told me that he had called my office a number of years back. He was still drinking then, and when he spoke with Ann, my senior assistant, he figured that, just like the people I referenced above, I wasn’t really serious about the whole “sobriety” thing, and that because he could pay my fee, I’d be happy to take his money and help him “play along” with making the case that he was no longer drinking. Of course, he found out that wasn’t going to work, and he told me that at first, he was mad, and probably just hung up on us. As time marched on, and as drinking problems go, he struggled. He had heard enough about sobriety to know that he was trying hard to get some. Back then, like most people dealing with an alcohol issue, he only wanted sobriety his way, a measure of it, really – just enough to keep drinking, but not get into trouble. He saw, however, that once the relationship to alcohol passes a certain point, a person simply cannot completely control or manage the drinking. Self-made promises to stop at a certain point, or not do this or that are routinely broken, only to be made again. And again. And again. Finally, some people, the lucky ones, see that the only way to get off this train is to get off the train. The alcohol express is headed for disaster, and the only way to not get there is to bail out. So they do. My client made the jump. He noted that he just woke up one day, hung over again, and had to make a phone call to get a ride for something. Although the language we used was more colorful than what I can repeat here, he said that he had just had enough. Drinking had long since ceased to be fun. He woke up, feeling like crap, had no car, no independence, had to hustle up a ride, and just realized that alcohol was the single consistent factor in everything that was holding him back. He thought back to his conversation with my office and suddenly had the light switch flip. He instantly knew that the problem wasn’t everyone else’s fault – it was his, and it all related back to his drinking. He became a bit apologetic on this point, but he basically said, look, here I am, wanting a license, ready to give my money away, and even a lawyer won’t take it. How much more do I need? To be sure, there was no offense taken on my part. Instead, I am truly glad that he had called me back then. As I thought about it, I realized that I am the only license restoration lawyer I know that requires sobriety before taking someone’s money for a driver’s license restoration. At any rate, my client got motivated to stop drinking, and by the time he sat across the desk from me, his entire being had changed for the better. When a person really does get sick and tired of being sick and tired, and feels enough momentum to be done with alcohol once and for all, they have taken the first real step toward solving most, if not all, of their problems. Right out of the gate, when a person stops drinking, he or she stops making everything worse. When anyone who has gotten sober looks back, it’s easy to see that a drinking problem can put you in a kind of “alcoholic fog,” so that when you quit, you get a clarity of mind that is a lot more and a lot sharper than just being “not drunk”. Of course, life itself gets better, and usually soon after that last drink. This can come sooner for some than it does for others, but everyone experiences it. Quitting drinking is not done in a vacuum. A person who quits drinking has to make a lot of other changes to support that decision. If you go to AA, you’re told to avoid wet faces and wet places. If you don’t go to AA, you find or at least figure out that you can’t hang out at the bar anymore, nor hang out with your party friends. You need to learn to socialize differently, without alcohol. You deal with anger and loss and sadness differently. You celebrate differently. Just about everything you do is different, but soon enough, all that “different” stuff is much better than what you had before. In time, not drinking just becomes second nature. Without fail, people who really quit drinking experience all kinds of positive changes. They ditch the drinking friends and form or repair relationships with people that matter. They earn back the trust and respect they lost from family and the real friends they left behind. They feel better, physically and emotionally. Perhaps most of all, when a person realizes that he or she has wrestled with and beaten a drinking problem, they realize that they can do just about anything. It is not uncommon to see people go back to school and learn a new trade, finish up a degree, finish or pursue an advanced degree, or just otherwise “move up” in life. The trajectory of a person’s direction in life always goes up, and usually way up, once he or she “puts the plug in the jug,” as the saying goes. If you’re really sober, then you have either experienced this, or are experiencing it right now. 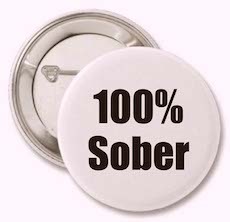 If, however, remaining sober is something that you just have to endure, then you’re not there yet. Whatever else, try and get there. Almost nobody in this world gets sober the first time he or she tries to quit drinking. If you did, then you are fortunate. If you didn’t, then take comfort in the fact that most people try (and fail) again and again before it sticks. The thing to bear in mind is that all of the people who succeeded kept trying. None of them quit trying to quit. This is an easy test. If you identify with what I’ve written, you “know” it. If you’ve been sober for a while, and you are otherwise legally eligible, I can get you back on the road with a valid license in your name. If you don’t identify with what I’ve written, or you feel that you want to explain how you’re different, then, whatever else, you’re not ready to begin a license appeal. Maybe your time is coming soon. You can always call my office; I’d love to help tip the balance of the scale in favor of your quitting drinking. In either case, my help is just a phone call away.